iPhoto has never before given me this problem. The first new pictures added this year were all in the last week. Otherwise my last transaction was Dec 10th. 1) Added from my desktop (in 2 batches) about 25 pictures all dated January 5th. I was surprised the following day to not find those pictures on iPhoto. Last Import showed the Dec 10th old stuff. Luckily I had not yet deleted photos from my desktop so again I dragged those photos into iPhoto and verified that they were all there, both as Last Import and as Photos. The following day the pictures were again missing. Once again I dragged the photos from desktop to iPhoto, verified that they were there, closed every application, restarted the iMac and double-checked that photos were in iPhoto. They were. However, the next day they were gone! 2) Yesterday, I downloaded from my camera photos taken Dec 13th and Dec 26th and not previously downloaded. I verified that they were in iPhoto and followed my usual procedure of deleting the pictures from the camera! So, I copied from iPhoto to desktop while they were available. Good thing I did because, lo and behold, this morning iPhoto denied all knowledge of these pictures. What is up, I wonder? Wondering if this iPhoto version is somehow programmed to refuse anything added after 2015? It is my guess that compared to most people I have relatively few pictures stored in iPhoto. Whenever I've had a heartstopping moment with photos not appearing where I expect them to be it's because I have left a restrictive search term on a particular album or project. Aperture's different in that the floating search box can be hidden. So, for example, a whole day's shooting in the mountains can seem to disappear if I've left the search term "Nisquallia" (an endemic Olympics grasshopper) in the search box. I did a test in iPhoto. I selected a project called Home 10-16. All the expected photos were there. Then I searched on "2015." The most recent photo was then December 30, 2015. All the 2016 photos "disappeared." Last edited by Stephen Hart on Sun Feb 14, 2016 4:04 pm, edited 1 time in total. Thanks, Stephen for looking at this. However, I don't think your idea of "project search" applies. "Last Import" has always shown me the last batch of photos imported. iPhoto seems consistently convinced that Dec 10th was the last day I imported pictures. Do you have a search set up in Photos (all your photos)? Have you checked your camera's date and time setting? Another possibility is that the photos are in iPhoto, just not where you expect them to be. Have you checked in iPhoto for events after Dec 10? iPhoto creates an event on each import. The images in Last Import are aliases. Have you already erased the cards? If not, you could try importing with Image Capture and tell it to import to iPhoto. I don't see anything from web searching indicating that iPhoto has a particular problem with 2016. 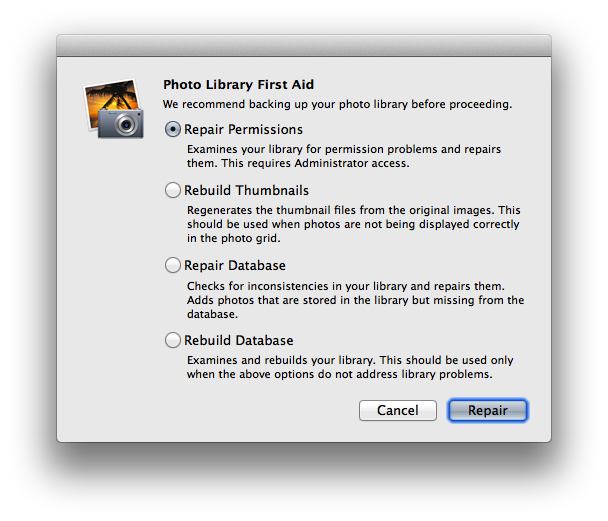 Note, however, that continuing to use iPhoto will certainly create problems at some point. Last edited by Stephen Hart on Mon Feb 15, 2016 2:28 pm, edited 1 time in total. Perhaps a rebuild of your iPhoto library is in order. Backup your files prior. Hold down the Command and Option keys on the keyboard. A dialog will appear with rebuild options. Select the options you want to use. Click Rebuild to begin the rebuild process. This thread went quiet, must have figured it out. No, Jay, I didn't figure it out yet - I got a bit overwhelmed with the scope of my problem and needed to get a few other things handled before I could tackle this again. I didn't have a lot of faith in Stephen's suggestion about my camera's date and such. I was willing to test all of it, despite being pretty sure that the results of suggested testing would leave my problem unsolved. The whole thing seemed a bit depressing. I was grateful for suggestions and willing to test, but not at all hopeful. However, I got very excited and hopeful when I looked here today and saw your suggestion to rebuild the library. It will be my next step and I will be able to do it soon. I want to do it carefully and with all my wits about me. I will report back after I get said wits gathered enough for courage to proceed. After rebuild of iPhoto's Database as per Jay's instructions I seem to retain new download. So, I am hugely hopeful that it will now remain stable for new downloads. Thank you, Jay ever so much for this simple solution to my very vexing problem. Thanks again also to Stephen for having thought about and explored my problem. I appreciate your kindness. I have listed the following solution report as a new thread on 03-23-2016. Jay's kind suggestion to rebuild iPhoto library seemed to solve the problem, but it quickly turned out not to be so after all. I noticed that new downloads stayed in the daytime, even if I restarted the computer. The disappearing of new downloads was always to be seen on the following morning. I asked myself: "What happens in the night with my computer?" Answer: "Super Duper back-up"
Now I had a suspect. Somewhere online I found in a forum an old listing of that exact problem - Super Duper and iPhoto. Having seen that someone else had had the problem, I decided that my first remedy to try would be to upgrade Super Duper which I finally did yesterday. This morning after back-up the new iPhoto downloads are intact. Hurrah! I think problem now really solved.